The publication of a resource book for teachers in the area of arts education for class IX is a timely and valuable step taken by the National Council of Educational Research and Training (NCERT). It is part of the fresh initiatives taken by the NCERT as a follow-up of the National Curriculum Framework (NCF), 2005 to improve arts education and to make it more purposeful at the high-school level. It is for the first time that such a well-considered guideline for arts teachers has been complied which defines the area of arts education for Class IX. The resource book includes the following four creative forms, viz, Visual arts, music, theatre art and dance, which have been divided into units. Very specifically, from the high-school stage onwards, the arts have been treated not only as integral inputs for the all-round personally development of the growing teenagers but also as career disciplines and future vocations, in the capacity of creative artists, musicians, dancers, actors, designers, architects or media communicators. Our country has reached a stage of economic growth and cultural maturity and diversity, especially through urbanization, wherein a wide range of new career opportunities area available in the field of arts. Therefore, there is a more compelling reason now to give due space to arts education at the high-school level as distinct from the primary-school level. It is a unique feature of these arts that each of them has evolved and developed simultaneously in our country since many centuries before the Christian era, about which we have become, aware through the discoveries made in the twentieth century. 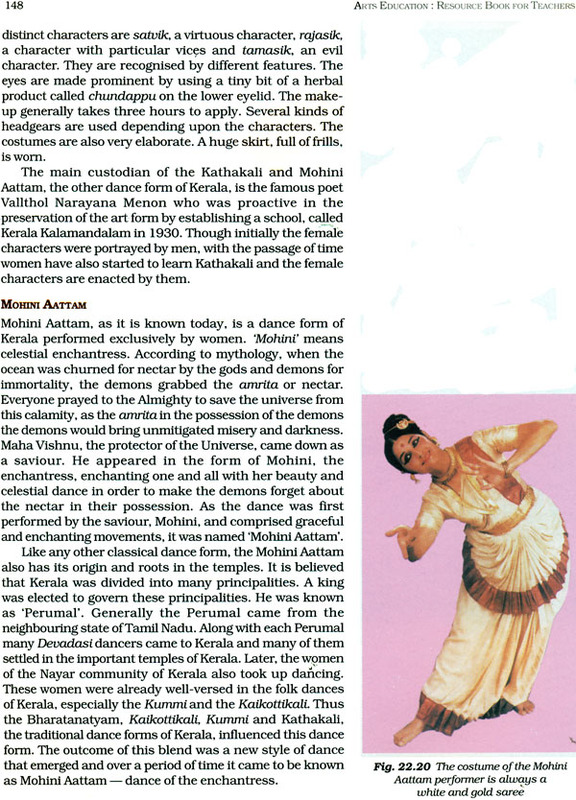 This century produced an amazing galaxy of highly creative painters, sculptors, musicians, vocalists, instrumentalists in Hindustani and Carnatic style, dancers and dance gurus of Bharatanatyam, Kathak, kuchipudi, Kathakali, Manipuri, and theatre actors and directors. There has been a simultaneous growth of professionals in technology-generated new fields such as film and television, and fashion and industrial design. Alongside the high standards of practice and performance is the remarkable phenomenon of growing expertise in theory, history and well-informed criticism of these arts. The objectives of spreading arts awareness among the Indian massed across the length and breadth of the country through the school education system have therefore many important aspects and cannot be limited to just activities of play, entertainment and aesthetic sensibility. The aims go beyond acquainting the young generation with our colourful, classical heritage as well as folk arts and crafts, to enabling them to handle societal functions and ever-widening professional roles. An aspect that deserves serious attention is the training of the arts teachers. 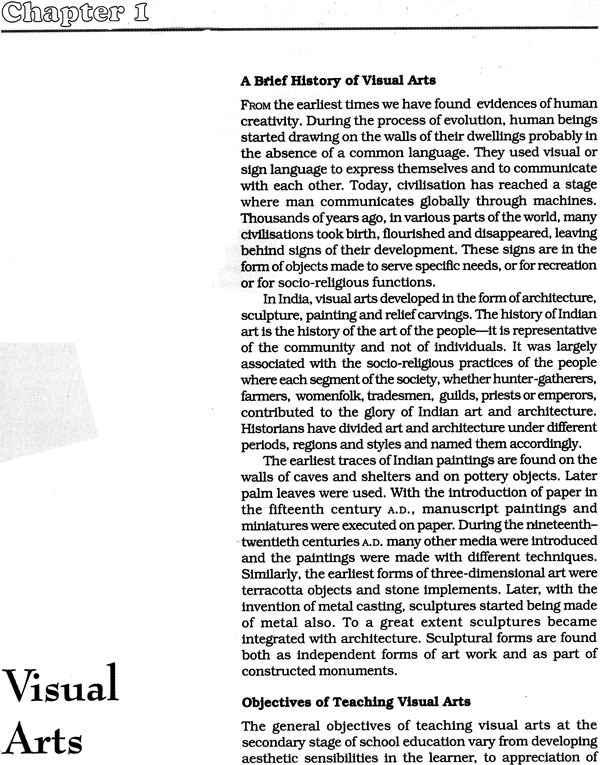 In light of my experience during the last half century, I would categorically state that the training for the teachers of Visual arts (Which was introduced during the British rule) is inadequate and will have to be upgraded so that the teachers are molded into more mature and intellectually suitable instructors. This will enable us to achieve the higher expectations that we have from the recently-devised programme in arts education. 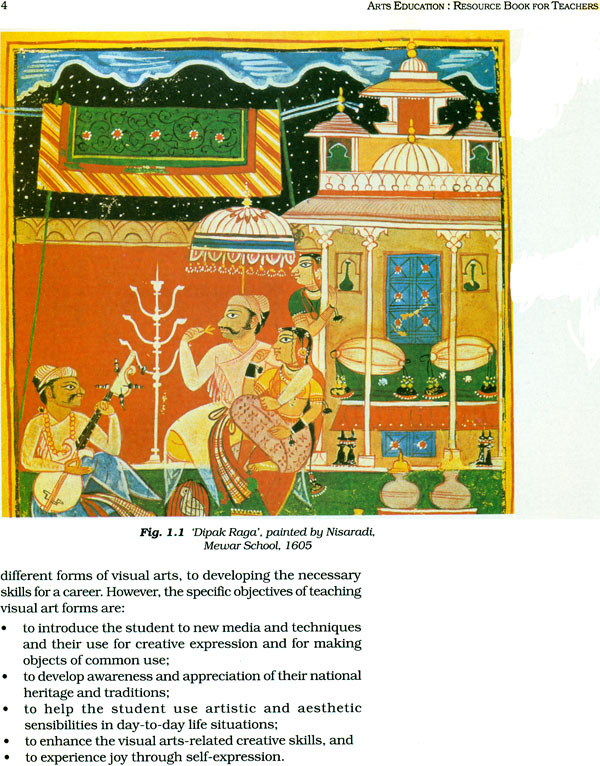 In the resource book, basic information has been given about each other of the four arts regarding its features and relevant levels of practical activities. The resource book is an essential reading materiel for the arts teacher and I would advice that teachers of all the four arts thoroughly read all the units. They should be aware of the range, level and standards of activities of all the arts. This is information will be stimulating and will also help them to function more effectively. Since the last many decades there has been an emphasis on teaching pupils the different art forms as a part of the school curriculum. Different educational policies and curriculum frameworks have also defined the purpose that the arts serve in the lives of students and when they grow up as adults. It is important that the pupil learn to appreciate different art forms and to apply his/her aesthetic experiences in his/her daily life along with using the arts for self-expression. The learning of the arts forms fulfils numerous objectives—students enjoy arts-related activities which helps ease the curriculum load; it helps release emotional stress through self-expression; students learn different art forms. 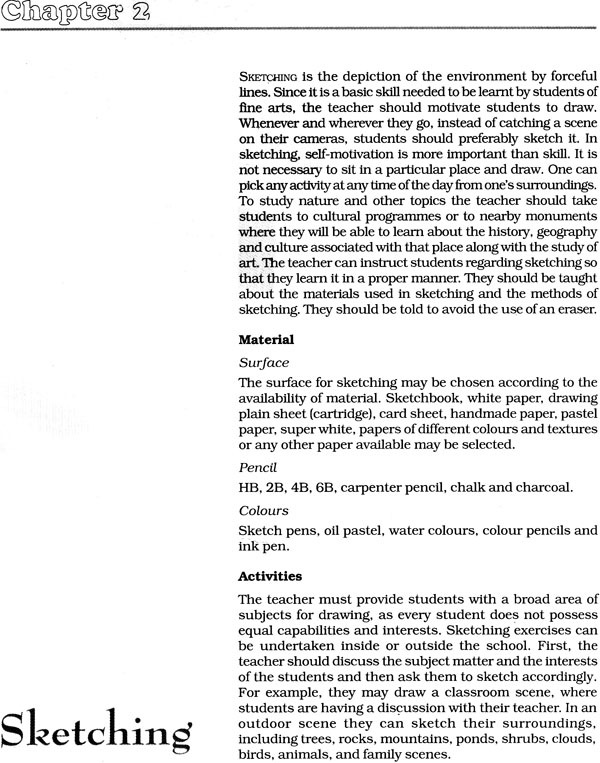 The National curriculum Framework, 2005 recommends arts education as a major curricular area of school education. ‘Arts education: Resource Book for Teachers’ for Class IX highlights the teachings—learning processes in different art forms to develop an aesthetic appreciation among the students at this stage. The five units of the book cover five different areas of arts education. 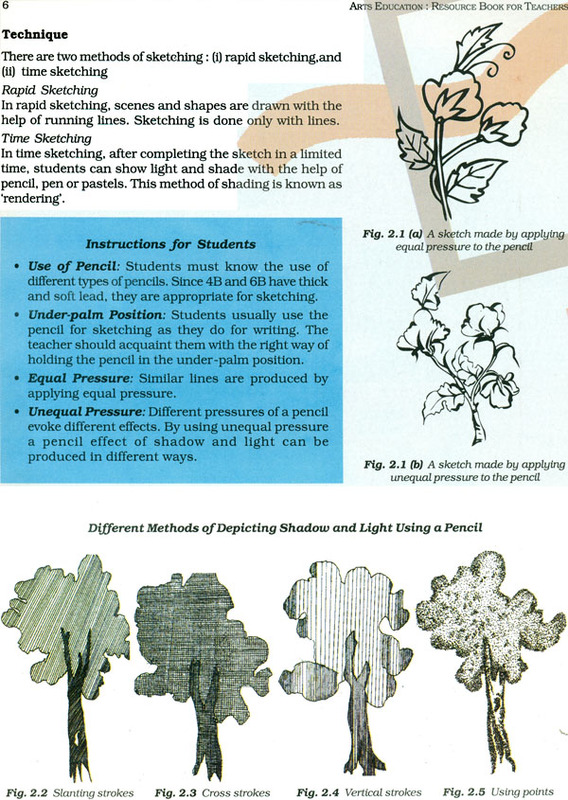 Unit I on visual arts includes seven chapters which throw light on the various techniques and methods of visual arts, Including two-dimensional and three—Dimensional art forms and the handicrafts of different parts of the country, which are appropriate for learning at this stage. Each chapter suggests a few activities related to a particular technique as illustrative examples. The teachers may give more examples and activities, depending upon the available resources and time. Unit II on Indian music includes both vocal and instrumental music, with their introduction, terminology, processes, etc. This information and also how it can be incorporated into the teaching—learning practices of teachers may give. 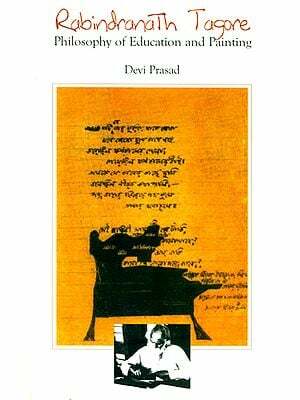 Bandish or lyrics are given as examples. The teacher may introduce any other lyrics of his/her choice. 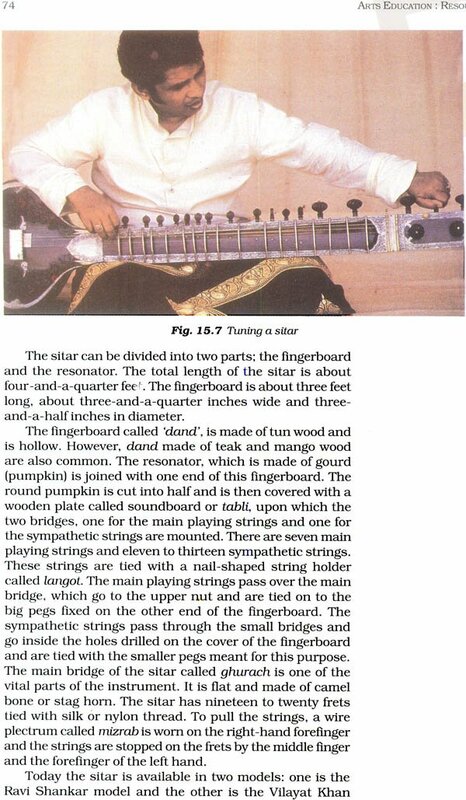 The chapters on musical instruments describe some of the Indian as well as Western instruments. A Knowledge of the historical development and technical aspects of theatre are equally important for students to acquire a better understanding of drama. 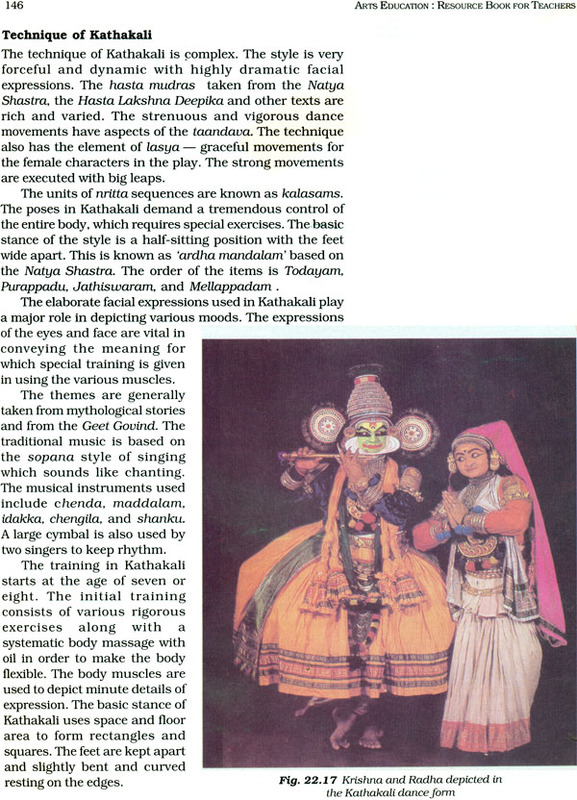 Unit III on theatre art gives a brief history of the theatre in India and in some other countries. This includes folk and traditional theatre forms. The technical aspects of drama have been given in a nutshell focusing on the writing of a play, the writing of a song, stages of directing a play, acting, costumes, make-up, lighting, sets, music, mask-making, and poster-designing. 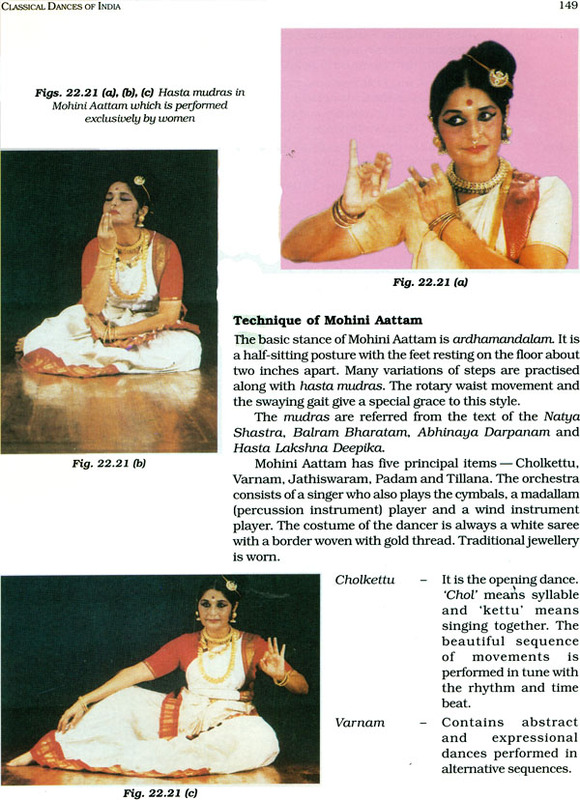 Unit IV relates to the origin of dance in India and the theory and techniques common to Indian dance forms. 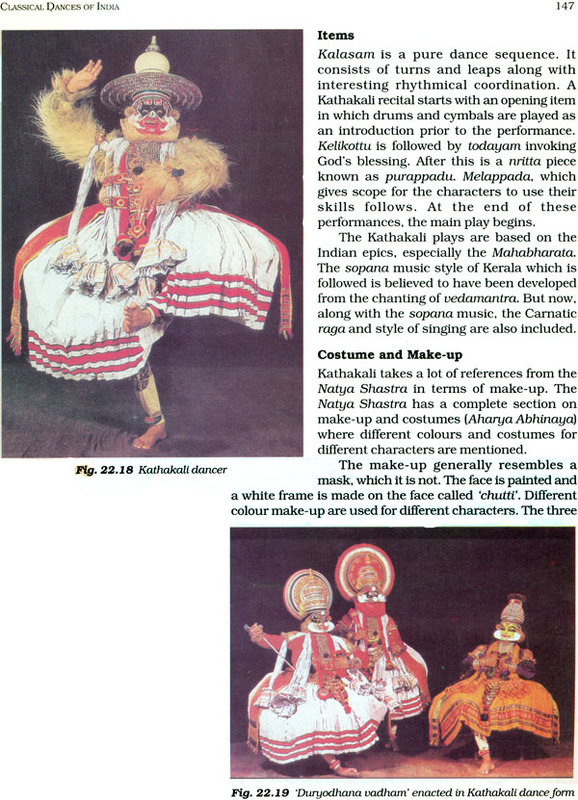 The classical dance forms of South India, such as Bharatanatyam, Kuchipudi, Odissi, Kathakali and Mohini Attam have been included in the resource book for teachers for Class IX and dance forms such as Manipuri, Satriya and Kathak as well as some folk dances will be included in the book for Class X. It has been observed that there is a paucity of information regarding the different career options available to the students and that by this stage of their education there should be sufficient awareness about the careers that they can pursue in the arts-related fields. Keeping this in view, Unit V has been developed which gives relevant information. This resources book gives some guidelines and expects the teachers to expand on these ideas with their professional skills and teaching experience, utilizing available resources.